She’s a fast-talking blond who breaks every rule of reporting. As a journalist, I should be appalled by Torchy Blane, but I really want to be her. She is the perfect mix of my profession and classic film love. 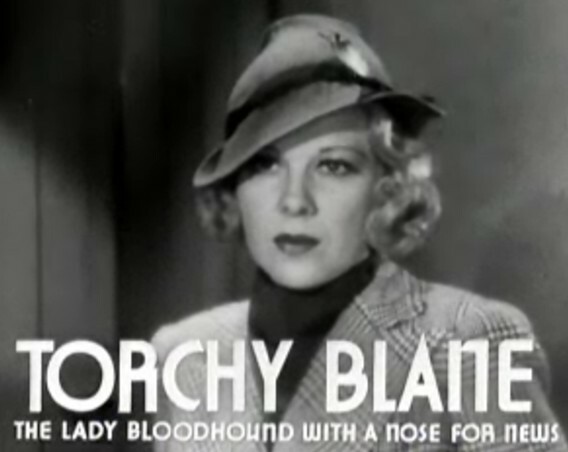 From 1937 to 1939, Torchy Blane solved crimes and caused trouble for her police detective boyfriend in nine films. 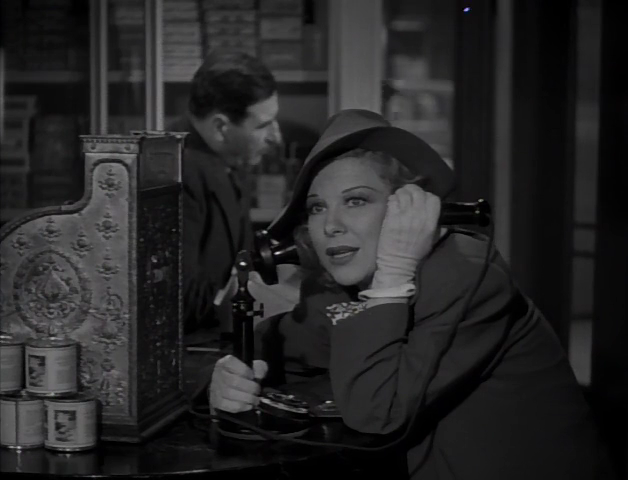 Glenda Farrell as Torchy Blane- my role model. She also was part of the inspiration for Superman’s reporter girlfriend Lois Lane. In a 1988 Time magazine article, creators of the Superman comics Joe Shuster and Jerry Siegel credited Glenda Farrell’s performance as Torchy Blane with their creation of Lois Lane. Produced by Warner Brothers Studios, the Torchy Blane series was one of many Hollywood B-movie series of the 1930s and 1940s, others include Maisie, Dr. Kildare, Boston Blackie, The Falcon and the Lone Wolf. Actress Glenda Farrell played Torchy in seven of the films while Jane Wyman and Lola Lane each played the role once. Though the other actresses play the part well, Farrell left the lasting impression. Her comedic timing, brassiness and nonchalant attitude brings Torchy to life. Her performances were complete with 400 word speeches given in 40 seconds as she talked her out of trouble. In many of the films, Torchy is causing more trouble than she is writing stories and meeting deadlines. Each film has a mystery to solve, and before Torchy’s detective boyfriend Steve McBride can take fingerprints, Torchy is one step ahead. Her job is really more of an amateur detective than a reporter. “Maybe you know who bumped him off,” Steve says in “Smart Blonde” (1937). “Not off hand, but with a little time and something to eat, maybe I can help you,” says Torchy. Our heroine usually solves the crime, leaving the police force and her detective boyfriend looking slightly foolish. It’s amazing she even has a job at a publication. At the end of each film, Steve McBride promises a steak dinner and marriage but at the start of the next film, there have yet to be any wedding bells. It’s possible that the Times mainly scoffed because the main character was a female star reporter, Good wrote. Torchy and her detective boyfriend Steve McBride played by Barton MacLane. Dressed in professional suits, Farrell modeled Torchy after female reporters she knew and tried to make her believable. Reporters could argue that Torchy Blane scripts are not representative of the newspaper industry. However, as a contemporary female reporter, I love Torchy. I even asked my editors if I could change my byline to Torchy Pickens…but was denied. Her sass, beauty and energy is endearing, even if she breaks every media law there is. This is part of the Summer Under the Stars blogathon by ScribeHard and Sittin’ on a Backyard Fence. This entry was posted in Reviews and tagged girl reporter, Glenda Farrell, Summer Under the Stars, Torchy Blane by Jnpickens. Bookmark the permalink. Thanks for informative piece. Sad to say, I’ve never seen any of the Torchy series,though I like Glenda Farrell. Will have to put that right. Jessica, I’ve heard of the TORCHY BLANE movies, but never had a chance to see them myself. Now that they’re on SUTS today, I look forward to checking them out. Nice to see Barton MacLaine, too, having enjoyed him in THE THIN MAN, THE MALTESE FALCON, and so many others! PS…Her boyfriend was the General on I Dream of Jeanie! These films look so corny, I love it! Ooh, these sound fun! I love that kind of old newspaper movie, with reporters who’ll do anything to get their story. Great post! I really enjoyed the Torchy Blane movies that were on, yesterday! I really am excited about the, blog-a-thon!! What a delightful tribute to Miss Farrell and her most enduring creation! I particularly love the quotes from Farrell and those she influenced. I also appreciate your insight as a journalist into Torchy—both her real and the unreal aspects. She’ll always be one of my ideals of a modern career woman, even if I don’t plan on hiding in trash bins any time soon… Thanks for sharing this! I’m now a fan of this gal just for her name alone. TORCHY BLANE. I love it!